Be sure you wet that thing before you remove it. "Why does my beard have a bandage? Does that even make sense? Why has no one pointed that out?" For some reason, Bob wears an adhesive bandage strip on his face, all the time. It's not because he cut himself shaving, or because he's just suffered some Amusing Injuries — in fact, he doesn't seem to be hurt at all. Apparently, the Band-Aid's only purpose is as an accessory to make his character design more visually interesting, or to make him easier to identify, or to make him look cool. Often shows up in animation, and is rarely commented on by the characters. Compare Bandage Babe and Sarashi; contrast Bandaged Face. A subtrope of Useless Accessory. The main character of Kenichi: The Mightiest Disciple uses one for no good reason (although he does get beat up a lot). He's actually nicknamed "Band-Aid" by one of the other characters. He does have a small scar under the Band-Aid. In the anime he doesn't have it until Miu puts it on a training wound. After that, it's virtually permanent. Tenchi Muyo! GXP's main character Seina Yamada wears a Band-Aid on his forehead (that somehow goes under his hair) most of the show. Initially it could be due to him being a Cosmic Plaything, but after being enhanced he's almost invulnerable and still keeps it, so it fits. Monta from Eyeshield 21 always wears a bandage on his nose. When a fan asked about this, it was confirmed he wears it just for decoration. Although this isn't the case for Monta, real football players will occasionally wear nasal strips, especially receivers. Ryohei and his First Generation Counterpart from Katekyō Hitman Reborn! both always have bandages on their noses. Ryo Shishido always wears a Band-Aid near his left eye. Eiji Kikumaru used to have one on his nose, then started wearing it on his left cheek. Pip Vernedead from Hellsing has one on his nose. He's always seen with one on, even during a flashback sequence of his childhood. Subverted in Flame of Recca: Recca's friends think the bandage on his face is just to look cool, but it actually hides a katana scar he received as a baby. Double Subverted in that when the reveal hits in, he just put the Band-Aid back and treats it like nothing happened, and that scar was never brought up again. Mellowlink from Armor Hunter Mellowlink has a Band-Aid on his cheek just below the eye. Makoto Kyogoku from Detective Conan has one on his left temple. Australia has one across his nose, Wy has one on her forehead, and recently Hutt Rier was shown to have one on his left cheek. Some of the male Japanese Prefectures have those too: Saga (nose bridge), Kagoshima (left temple), Kumamoto (left cheek) and Tokyo (middle of the forehead). In Moyashimon, Aoi Mutou is introduced wearing one of these, though according to the author's notes it's because she got sunburned on her journey back to Japan, and she eventually stops wearing it. In one episode, Renge gives Shiro a few of these (both on his face and his knee) when she's trying to turn him into a scrappy "naughty type". Also, a later episode has the Host Club putting a bright pink one right on Kasanoda/Casanova/Bossa Nova's face (along with a few other things,) in an attempt to help change his image. Subverted in Loveless. At first it looks like Ritsuka is playing this trope straight, especially since he initially gives off an delinquent impression, but we find out later that he has a very real reason for it. Gingka from Metal Fight Beyblade has a band-aid on his nose. Els Tasmin of Magical Girl Lyrical Nanoha Vivid had these at the start but were slowly phased out. Her first appearances showed her with band-aids all over her arms. During her match with Harry, the ones on her arms had disappeared, but she still had one on her knee. When she started appearing again as a more regular character, she no longer had any band-aids on her. In Zettai Bouei Leviathan, Jörmungandr has one on her nose. Nice from Hamatora has three on his face. Bear from Yo-Kai Watch has permanent bandage on his face to signify he is the Bruiser with a Soft Center of his group. Max Taylor from Dinosaur King has a band aid on his nose in the very first episode after Chomp bites it. The protagonist from Spirit Circle always wears a bandage over his cheek. It turns out he's wearing it to cover a rather bizarre birthmark he has on said cheek. Said birthmark came from a past life where he had the mark burned onto his cheek by a witch he was ordered to kill, and that mark has persisted through multiple future lives, representing her hatred of him even through reincarnation (though that was not the life where her hatred for him began. Monta from Pocket Monsters BW: The Hero of Thunder and Fire wears a bandage on his nose for no apparent reason. In early Deadpool comics, Deadpool's rival T-Ray wore a bandage across the bridge of his nose all the time. According to a letter column it wasn't originally pointless, having been put there to hold his nose to his face after it fell off; eventually his Healing Factor took care of the problem, but he kept wearing it for no real reason. DMZ: Protagonist Matty Roth inexplicably starts wearing a bandage over the bridge of his nose in issue 3 and has it for the remainder of the story, spanning several years. It disappears briefly during a temporary artist change and then quickly returns. In Pulp Fiction, Marcellus Wallace has a bandage on the back of his neck that is never explained or commented on, but is highly visible during a scene in the movie where he is interviewing another character. This led to the Epileptic Tree that the briefcase contained Marcellus' soul, and it was removed from the back of his neck, hence the Band-Aid. In reality, it was just there to cover a scar on Ving Rhames' neck. The Parisian taxi driver in Night on Earth has a bandage on his forehead. The director admitted in the DVD extras it was there for visual interest. One of Bill Cosby's published anecdotes "Was Tarzan a Three-Bandage Man?" is about the neighborhood kids wearing band-aids over no injuries whatsoever in trying to make themselves look tough. In WKRP in Cincinnati, newscaster Les Nessman always has at least one Band-Aid visible. It was eventually explained that Les owned a large dog that we never see. In Real Life, however, the actor playing Les suffered an injury prior to the taping of the first episode and wound up wearing a bandage during filming. He decided to make it a trademark of the character, and tried to avoid wearing a Band-Aid in the same place twice. Rab C. Nesbitt: The title Glasgow anti-hero always has a dirty cloth bandage around his forehead, sweatband-style. Eventually he met his Spanish counterpart, who also wore one and addressed him as "Bandage!" Code Lyoko: Evolution is a Live-Action Adaptation of Code Lyoko (see below) for the real-life parts, and Jim Moralès' actor still faithfully sports the band-aid. During an early-season episode of Saturday Night Live, John Belushi inadvertently cut Buck Henry with his sword during a Samurai sketch. For the rest of the show, the other cast members sported Band-Aids in tribute to Henry. Celebrity Juice: Keith Lemon, a character played by British comedian and actor Leigh Francis, always wears a bandage around his right hand and wrist. In the past, it was explained as covering up a risqué tattoo but now the reason seems to be it's a form of artistic expression. A previous character portrayed by Francis, Avid Merrion, always wore a neck brace. Persona 3's Akihiko Sanada has a bandage permanently over his left eye, just to remind you he's a boxer. In middle school, he actually wore one over his nose. Kazuma Sakomoto from Cave Story. In Disgaea 2, Adell's younger brother, Taro, sports one of these on his left chin/cheek. Wendel of Suikoden IV and Suikoden Tactics has a white strip on her left cheek, just under the corner of her eye. Maylene from Pokémon. Given the fact that she's a martial artist and trains fighting Pokémon, she may have injured her nose at least once. However, it appears to be mostly to make a point. Kooper from Paper Mario, but just his character artwork, though. Koops in the sequel appears to have one. Given his shy, clumsy nature, however, it's probably there for a reason. Maybe because you keep kicking him in to things. In Alpha Protocol, SIE wears a band-aid on her left arm. The player never sees her get injured there, but she is a mercenary. Jimmy, the protagonist of Ape Escape 2 wears a bandage on his nose. It is never explained why. Gene from God Hand has a square blue one on his left cheek bone. Sure, he's a rough-and-tumble drifter, but it's really unnecessary. It's still cool, of course. Luke from Harvest Moon: Tree of Tranquility wears a bandage on the bridge of his nose. Crazy Earl in the first one. Granted, in the first game he lives in a dangerous scrapyard infested with bandits, but the second game takes place much later (when he's safely in the base of operations for La Résistance) and he still has a band-aid on the exact same spot on his nose. In Borderlands 2, has Salvador who also wears one over his nose. Given his personality, it's likely that it might actually be broken. The first DLC character for the second game, Gaige the Mecromancer, has one on her cheek. Given she's a tomboy who identifies as a punk, and medical technology allows much more serious injuries to be heal with a simple injection, it's most likely purely cosmetic In-Universe. Tiny Tina likewise wears one across the bridge of her nose. Of course, she spends much of her day surrounded by explosions. Ryo Hazuki from Shenmue always has a white adhesive strip on his upper left cheek. In some early production images it's an ordinary Band-aid instead. In Star Fox Zero, Wolf sports one on his face after the player unlocks a secret fight against him. Apparently being a crook with injuries can only afford you those. A bandage on the cheek is available as a character customization option in Pokémon X and Y. Only when you're shooting in-game promotional videos for yourself, however. Bandages (one on the cheek, one across the bridge of the nose) are an accessory in the Animal Crossing games. Occasionally, villagers will ask if your character has hurt themself. Sayo Samonji from Touken Ranbu has little white bandages on his face and knee. If he is heavily injured, the cheek bandage is replaced by a large bleeding cut. Aizen Kunitoshi has a more traditional and less period-appropriate bandaid across his nose, which is a permanent part of his character design. Jam and Tommy in Snowboard Kids both have one on their noses. Kazuma Suzuka from Tokimeki Memorial Girl's Side always wears a band-aid under his left eye, perhaps as a shorthand to indicate that he's into sports. In the Phoenix Wright: Ace Attorney series, Detective Gumshoe has been wearing a bandage in the same spot on his left cheek for at least seven years. It's almost-but-not-quite lampshaded in Investigations, when he asks, "Do I have something on my face or something?" to which the response is, "Well, actually..." The whole dialogue seems to be drawing attention to his Pointless Band-Aid, and then the punchline ends up being "haha, it's your face" or something equally ignoring it. Clay Terran in Dual Destinies seems to wear one across the bridge of his nose. Either it's pointless or he's had a broken nose since he was a kid. Kenstar of Girlchan in Paradise!! wears one across the bridge of his nose, as does Maytag, his Distaff Counterpart. Mystery Skulls Animated: Lewis's little sister Belle has a band-aid on the bridge of her nose, in combination with a number of other band-aids which to imply she's a pretty active kid that ends up getting scrapes often, but the one on her nose seems to just be shorthand for her active personality. In episode 9 of Let's Go! Tamagotchi, Mametchi has a bandage on his right cheek that is never explained while Memetchi and Makiko argue over who has better curls. Saki of Frivolesque always has such a band-air on her left cheek. There's also a less noticeable one on her left knee as well. There is no in-universe reason for either of them. Doc Worth of Hanna Is Not a Boy's Name has a crossed pair of bandages on the right side of his forehead; they're not always present in the strip, but they were in his first appearance and generally show up when Tessa draws him outside continuity. Worth probably needs the bandages, though, since he apparently gets into scrapes a lot. And it's not on his face, but Hanna is also often seen with what looks like a similar crossed-over pair of bandages... on the knee of his pants. Seven in Off-White has one across her nose. Orn "Dutchy" Ayers in Survival of the Fittest v4 is mentioned as wearing a band-aid over the bridge of his nose. His profile confirms that this is more of a personality quirk/casual accessory than the result of an injury. Neopets has the Kikos, an entire species that has these. Despite not being blind, Hesperia from Killerbunnies has been observed to wear bandages over her eyes and only reveals said eyes when she is telling the future or something in relation to that. Jim Moralès of Code Lyoko always wears a band-aid on the left cheek. He's seen once putting on a fresh one, but we're never shown what's underneath. In the Avatar: The Last Airbender Super Deformed Shorts, Mai has a band-aid on her nose. Ratso from Jackie Chan Adventures wears one. Somewhere it was said that this was for a fashion statement. 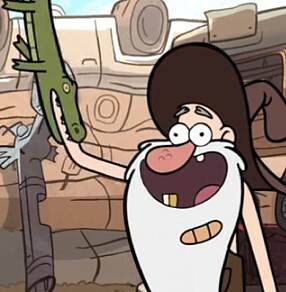 Gravity Falls: Self-proclaimed "local kook" Fiddleford "Old Man" McGucket has a pointless band-aid on his beard. Lampshaded by the man himself during "Society of the Blind Eye". McGucket: Hey, why does my beard have a bandage? Does that even make sense? Why has no one pointed that out? We find out it has a reason to be there, even if it is currently pointless: It was originally applied to his chin after a car crash he suffered 30 years earlier. The Sanity Slippage he was undergoing at the time caused him to forget it was there, meaning his beard grew out from under it. A Freeze-Frame Bonus in "Sock Opera" hinted at the revelation: the laptop, which later turns out to be McGucket's, has its own bandaid. In the Rainbow Brite franchise, Patty O'Green wears a band-aid on each of her knees. Hip Hop recording artist Nelly used to wear a small bandage on his cheekbone as a tribute to one of his "homies" who was in prison. Pianist Alfred Brendel wears bandages on his fingertips when he plays, supposedly to absorb sweat from his hands so his fingers don't get slippery. Some people use them to cover scars or other facial imperfections that they can't or won't disguise with cosmetics. This is also a way to cover tattoos (say, on the knuckles) if company policy prohibits visible ink. What, Exactly, Is His Job?